Next week Danielle Olson heads to Mexico to work for a nonprofit Dutzi Design which seeks to empower the Mayan women of Valladolid, teaching them entrepreneurship. To support these efforts Danielle has organized a Trunk Show fundraising event to showcase these women’s handbags. The event will begin at 8pm, June 3rd on the rooftop of the restaurant Sundown at Granada (which is located directly next to Granada theater), 3520 Greenville Ave, Dallas, TX 75206. Two other companies will be showing their stuff including Commonwealth Couture, a designer vintage shop located in Snider Plaza. The other is jewelry designer Shona Gilbert who will be showcasing her work. Live Hair Group (a hair salon across from the venue) will set up a booth that will do free hairstyles for all the guests. All are invited to come and support this great cause! 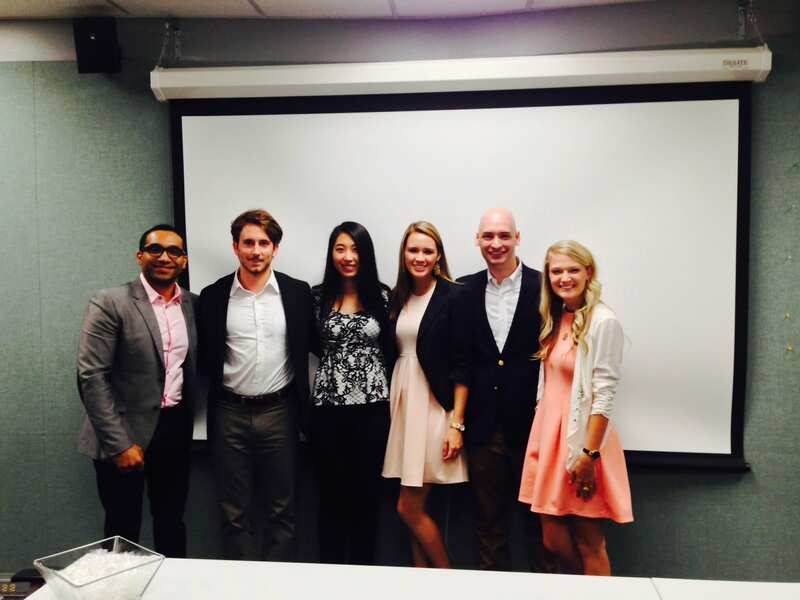 We love seeing our Temerlin Advertising Students changing the world! Way to go Danielle. 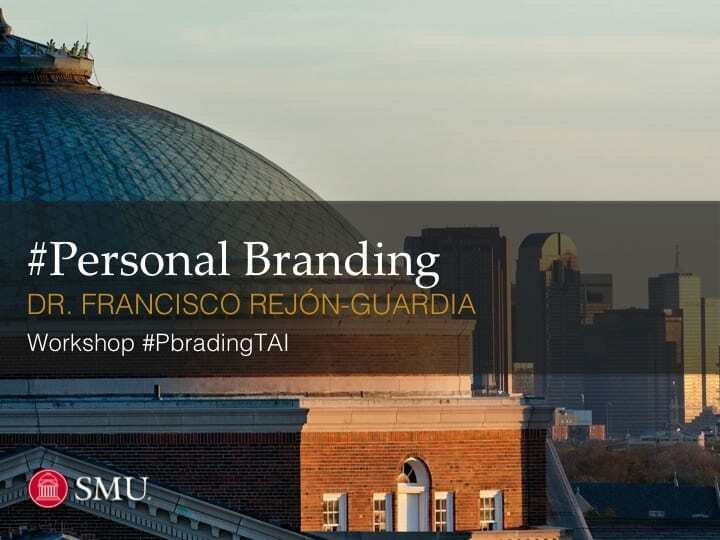 #Personal Branding workshop presented by Dr. Francisco Rejón-Guardia, Visiting Professor for the Temerlin Advertising Institute. During the workshop, Dr. Rejón-Guardia shared strategies and tips for developing a personal brand and strong reputation online. Since one in three employers look at a job candidate’s social media (Facebook, LinkedIn, Twitter, Instagram, etc. ), Dr. Rejón-Guardia says it’s important to know the image of yourself you are projecting online. His strategies for developing a strong personal brand, both online and off, include knowing your target (i.e. potential employers, jobs, etc. ), being specific with your personal tag/slogan, being professional, emphasizing your area(s) of specialization, knowing and telling your story, providing a consistent image of yourself, being genuine, and providing value to your industry. For more on his presentation, click here. Dr. Rejón-Guardia explains his strategies for developing a strong personal brand to Temerlin Advertising Institute students and faculty. Dr. Rejón-Guardia is an Associate Lecturer in Marketing and Market Research at the University of Granada (Spain). His research interests include online consumer behavior, e-commerce, new advertising formats, and market research methodology. Dr. Rejón-Guardia has been a Visiting Professor in the Temerlin Advertising Institute since April 2014. He is using his time in the US to collaborate with American colleagues on various advertising and marketing research projects for publication. Temerlin Advertising Institute Professor Willie Baronet is seeking support via a crowd funding campaign for a coast to coast homeless sign buying trip from Seattle, through LA, to New York. The goal is buy signs, create a documentary, book, and more! These signs – and this practice – have become a catalyst for conversations about the nature of home, homelessness, compassion, and how we see and treat each other as humans. It has also heightened my awareness about my own upbringing and home life. My goal is to buy as many signs and connect with as many homeless people as I can. In addition to the art installations/projects that will result from these new signs, there will be a book and a documentary film of the entire experience. Plus, I’m partnering with the Housing Crisis Center in Dallas to raise money and awareness for their program to help homeless veterans. Your help is critical. The more people who get involved, the more meaningful the project (and the conversation about homelessness) becomes. David Hadeler, President of SKSW Advertising and SMU Advertising Professor at the Temerlin Advertising Institute talks about the campaign waged by Virgin America Airlines against Southwest to launch service at gates Love Field in Dallas. Professor Hadeler is at 1:11 in video. 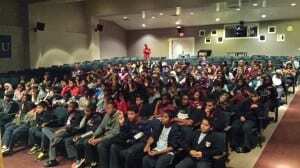 See whole story at NBC 5 in Dallas. SMU Advertising Students are “Happy” in (and out of) class! SMU’s Spring 2014 Intro to Creativity class comes together to create a Happy Video inspired by Pharrell Williams. 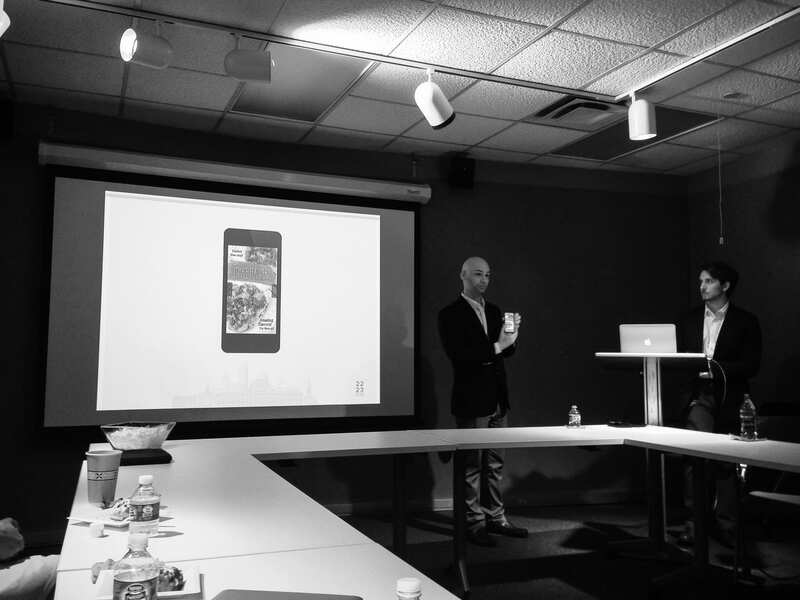 The Temerlin Advertising Institute class explores creativity and the creative thinker’s role in shaping the culture in advertising. The class is part of the new minor and major in advertising as well as part of the minor in graphic design. 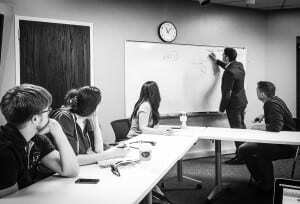 An advanced course on Creative Problem Solving is also offered as part of the M.A. program at the Institute. As a final project for the Responsibility and Social Entrepreneurship (ADV 6372) class, two teams of Temerlin Advertising Institute graduate students—ADmire and 22/23, under the supervision of Assistant Professor Sidharth Muralidharan—created advertising campaign proposals with a social responsibility focus for SMU Dining Services. The primary emphases was to create awareness of the various services offered by SMU Dining Services among freshmen and sophomores, and also to create opportunities to meaningfully impact the lives of students in other ways than just nutrition. 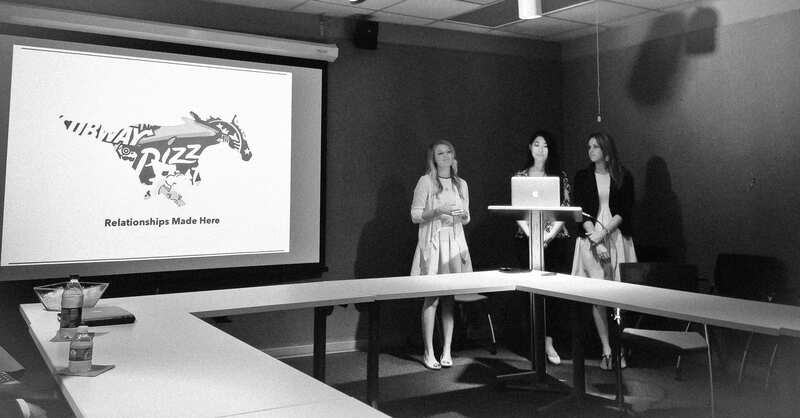 Members of ADmire present their campaign to SMU Dining Services. 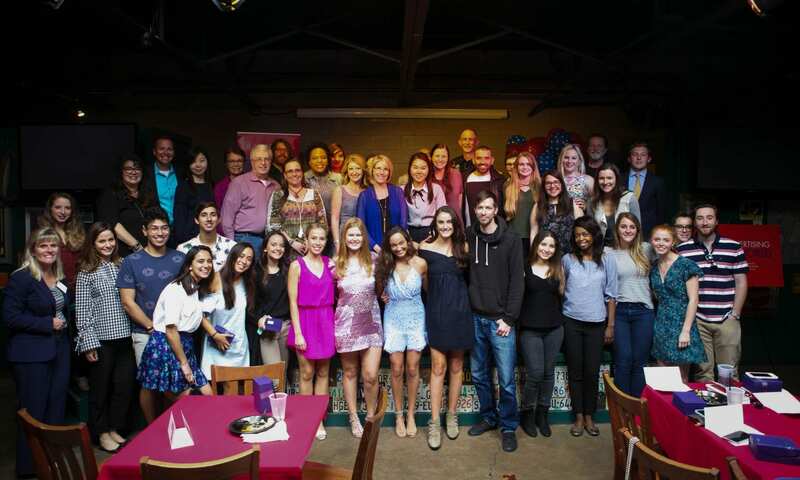 ADmire focused on how SMU Dining can enable connections with students by working with student body organizations and raise funds (via dining locations) that support college events. Keeping millennials in mind, the highlight of 22/23’s campaign strategy was their ‘SMU Scoop’ mobile app and how this tool can be used to not only spark a sense of togetherness but also help students connect with on-campus activities. Members of 22/23 present their ‘SMU Scoop’ app idea. 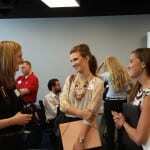 Social responsibility is a cornerstone of the Temerlin Advertising Institute’s Masters in Advertising program. ADV 6372: Responsibility and Social Entrepreneurship is just one of several courses with a focus on social responsibility that students in the Institute’s MA in Advertising program are required to take. These courses, and the experiences gained through working with real clients, equip graduates to become leaders in the advertising industry by helping them recognize their responsibility to their brands, their consumers, their industry and their society. Masters in Advertising students with Dr. Sid Muralidharan, Assistant Professor. 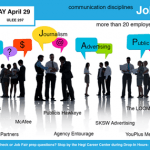 On April 29, the Temerlin Advertising Institute, along with other SMU communication disciplines and the help of the Hegi Family Career Development Center of SMU, hosted a Job Fair. 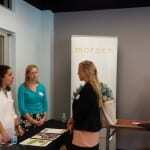 Almost 30 employers attended and many students secured interviews for internships and permanent positions. Thank you to all of the employers and the work of TAI faculty, staff and students for helping to make this a great event for everyone.